The Toolbox Project1,2 Collaborative Communication Workshop provides a philosophical yet practical enhancement to cross-disciplinary, collaborative science. 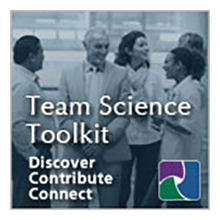 Rooted in philosophical analysis, the Toolbox workshop enables investigators, research development professionals, project managers, and collaborators to engage in a structured dialogue about their research assumptions and cross-disciplinary collaboration. This yields both self-awareness and mutual understanding, supplying individuals with the robust foundation needed for effective collaborative research. Led by Toolbox Project Facilitators, Workshop participants will engage in small group discussion and share respective views in response to a number of probing statements about science motivation, methodology, confirmation, objectivity, values, and reductionism. Pre-formed groups of collaborators can participate together, please contact Holly Falk-Krzesinski for more information. 1Eigenbrode, S.D., O'Rourke, M., Wulfhorst, J.D., Althoff, D.M., Goldberg, C.S., Merrill, K., Morse, W., Nielsen-Pincus, M.A.X., Stephens, J., Winowiecki, L., et al. (2007). Employing Philosophical Dialogue in Collaborative Science. Bioscience 57, 55-64. 2Crowley, S., Eigenbrode, S.D., O’Rourke, M., and Wulfhorst, J.D. (2010). Cross-disciplinary localization: A philosophical approach. MultiLingual, September, 1-4. Linked open data (LOD) as a technology that uses the Web to connect related data, is well-poised to transition from proof-of-concept prototyping into significant, high-visibility projects. The analytic/algorithmic aspects of Team Science can readily capitalize upon the graph structure basis of LOD, directly consuming many of the common ontological classes already accessible in LOD form. This workshop will explore the nature of LOD and its applicability and utility to Team Science. Particular emphasis will be placed on the provisioning of Team Science class data as LOD and consuming LOD in Team Science class applications. Research networking (RN; knowledge management for the research enterprise) will be used as a primary motivating application to ground discussion, with examples drawn from representative RN tools (e.g., VIVO, Loki and Profiles). Topics covered in the workshop will include: Basic LOD principles; Why this technol-ogy matters to the SciTS community; Getting started serving data (i.e., Resource Description Framework, RDF); Getting started consuming data (i.e., SPARQL); and Integration with other frameworks (e.g., Drupal).